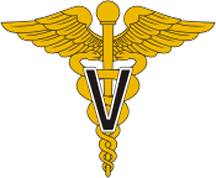 The U.S. Army Veterinary Corps is a staff corps (non-combat specialty branch) of the U.S. Army Medical Department (AMEDD) consisting of commissioned veterinary officers and Health Professions Scholarship Program (HPSP) veterinary students. It was established by an Act of Congress on 3 June 1916. Recognition of the need for veterinary expertise had been evolving since 1776 when General Washington directed that a "regiment of horse with a farrier" be raised. It has evolved to include sanitary food inspectors and animal healthcare specialists. The U.S. Army Veterinary Service is currently[when?] composed of more than 700 veterinarians, 80 warrant officers, and 1800 enlisted soldiers in both the active duty and in the Army Reserves. The Chief of the Veterinary Corps is a Brigadier General. The Veterinary Service employs an additional 400 civilians. The Health Professions Scholarship Program (HPSP) allows qualified recipients to earn a full-tuition scholarship, plus a monthly allowance, to attend an accredited veterinarian school in the United States. Students commissioned through the Reserve Officer Training Corps (ROTC) may apply for an Educational Delay to attend veterinary school. ^ "Development of the Army Veterinary Service 1916-1940". U.S. Army Medical Department - Office of Medical History. ^ "Once upon a time". Association of Retired Enlisted Veterinary Personnel. 2009. Retrieved 2014-05-06.